Are we too normal to create or are we crazy enough to try it? Following the Universal Artist, the composer who creates the opera and at the same time tries to fight the schizophrenic crisis through which he passes. Is it possible to express in the artists’ way at that moment or is it maybe the solution? 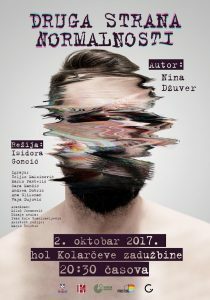 Performance “Other Side of Normality” deals with the issue of creation and artistic expression concerning people with mental disorders. It was realized in cooperation with the association Prostor which carries out art therapies with users of psychiatric institutions, in cooperation with City Guerilla and the support of Goethe-Institute. 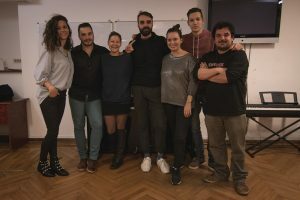 The Other Side of Normality is the performance that appeared as the pilot project that was performed at Take Over Festival in November 2016 in Kolarac.